I've always liked The Crazies (1973) but it actually hasn't aged as well as I'd hoped. The last time I watched it was in 2010 (just before the remake was released) and I'd seen it maybe 2-3 times before that. This most recent viewing of the film seemed to reveal characteristics that knocked my opinion of it down a notch. For instance, the acting. Richard France is the hammiest of the hams (and it works to a certain degree, but it's more humorous than anything). Richard Liberty is good here but he really gets to shine in Day Of The Dead (1985) (which is my favorite of the Dead films and which I prefer to The Crazies when it comes to Romero films with "men being macho/overacting/yelling loudly"). And while I'm sure the military drumming score is intended to invoke a feeling of tension and constant movement, I find it largely grating. 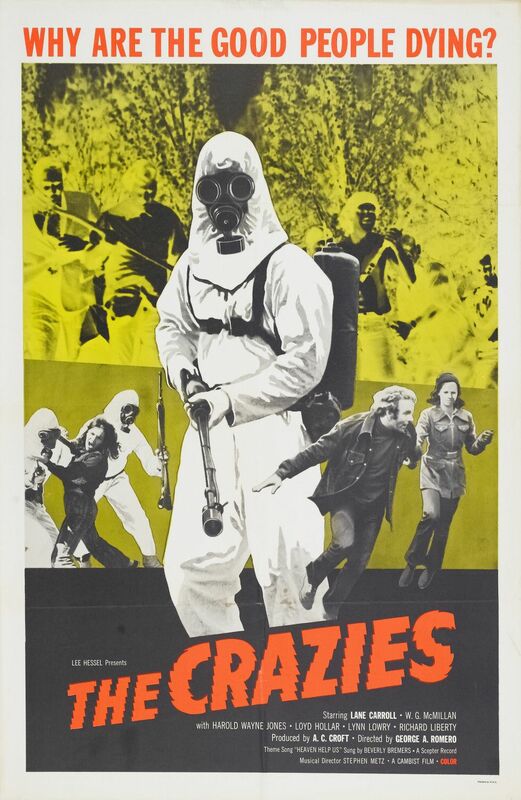 All of which isn't to say that I don't appreciate a good deal about The Crazies. The low budget spirit that permeates the film shines through — you can tell the crew was passionate and had to work hard and likely quickly. Romero's experimental rapid-fire editing and overlapping dialogue (a director trademark) is certainly interesting and gives the film a special flavor as well. Plus I dig the ambiguously bleak ending. Check out my George A. Romero Feature Films Ranked list here.